Resale certificates are used by vendors to purchase property or services that are intended for resale. The buyer presents the seller with the resale certificate. When a buyer has a valid resale certificate, no tax is charged for the purpose because it will ultimately be charged to the end user. Vendors may use resale certificates for single purchases or as a blanket certificate that, when given to the seller, covers additional purchases of the same general type of property or services. Generally, to obtain a resale certificate, a business must first have a valid sales tax account. Sometimes a business may use that account number of a form resale certificate issued by that state. All they need to do is print the certificate, write in their account number and business information, and present the certificate to the seller. In other states, the business must take another step and apply for a resale certificate. If the state approves the application and the business activity, a resale certificate and number is issued by the state. These certificates are generally issued for one or two year periods. 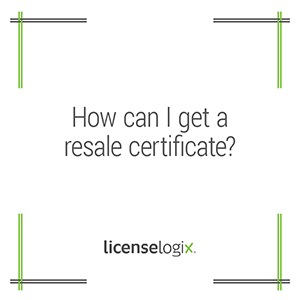 LicenseLogix will help resellers obtain all licenses and registrations for your business, minimizing time-consuming and costly delays. For additional help you can fill in the form on the bottom or give us a call at (800) 292-0909.